Polybloggimous: Keepin' The Man Down...Or At Least The Building. What's this little building Nathan's posting pictures of? What's so special about it? Nothing much really, but buildings like this catch my attention sometimes. It's a little one-story restaurant at the corner of 2nd Avenue and E. 46th Street in Manhattan. According to one of the websites I use to figure out property information in NYC, it was built in 1967. It's obviously been renovated and it is currently preparing to open as a Turkish Restaurant. So, once again, what's so special about it. Well, look at its neighbors. Talk about your inferiority complex. I love it when there's a little building in some of the most expensive real estate in the country. I'll keep my eyes peeled for examples but there are a few places where there was an old 3 or 4 story building owned by some old lady who just refused to sell. So the developer just builds to completely surround the smaller building. I'm pretty sure there's an example on Third Avenue where the developer was able to secure air rights, so the new building completely envelops the older one, with just the face of the old building still exposed. 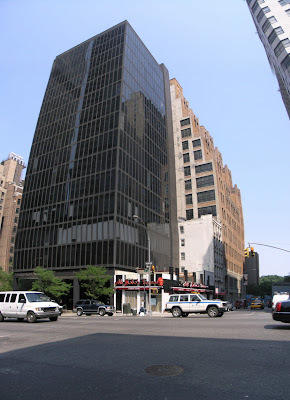 I've always had this fantasy that if I had all the money in the world, you know, Bill Gates kind of money, I'd buy a large piece of property on Third or Lexington Ave. It would be one full block from North to South and maybe 1/4 or half a block from East to West. Then I'd tear down whatever was there and build a little one story ranch house....with a pristine green lawn, circular gravel driveway and white picket fence. It just strikes me that such a blatant disregard for property value would be the biggest in-your-face display of wealth you could imagine. I'm not sure I'd want to actually live there, but since it's never going to happen, I won't lose a lot of sleep worrying about it. And one other thing occurred to me while I was typing this. This is a perfectly good blog post that I could type up and just publish it any old day that I couldn't come up with anything else. There's nothing time sensitive in the post that would date it if I saved it for a rainy day. And it's not like I haven't already put up two posts today. GF has, on any number of occasions, told me I'm a blurter. Something comes into my head and straight out of my mouth. Apparently, I also blurt as a blogger, too. Nathan, you're perverse. I like that about you. As blurts go, this was a sparkler. Keep'em coming, Nathan! I've always had this fantasy that if I had all the money in the world, you know, Bill Gates kind of money, I'd buy a large piece of property on Third or Lexington Ave. It would be one full block from North to South and maybe 1/4 or half a block from East to West. Then I'd tear down whatever was there and build a little one story ranch house....with a pristine green lawn, circular gravel driveway and white picket fence. So now you neeed to change the name of your blog from "Polybloggimous" to "The Blurting Blogger." And you'd be my hero just for getting "Bill Gates kind of money." As to getting Bill Gates kinda money, I'll happily accept donations. And Vince...please take look at the Charlotte Misner link on the top of the sidebar. There's some stuff there that will update he Bible. Nathan - when this article ran in this morning's paper - I thought of your post.